Clumber House in the 1830s. 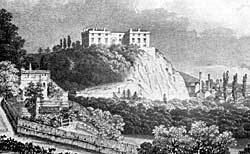 The Ducal Mansion of Nottingham Castle before the fire of 1831. Clumber House was demolished in 1938 and the estate passed into the hands of the National Trust in 1946. The park and remaining buildings now form one of the most popular sites of leisure activity in the county and provides the regional Headquarters for the National Trust. Nottingham Castle was transformed into a municipal art gallery for the town in 1878 but retains much evidence of its historic importance and its links with the Newcastle family.